Conveniently wall-mountable and built to provide many years of dependable service, CleanStart® is an innovative detergentless laundry system that can free you from ever having to buy laundry detergent, fabric softener, and bleach again. Manufactured by RainSoft, CleanStart® infuses cold wash water with one of nature’s most effective cleaning agents – Activated Oxygen. It eliminates the need for costly soap, consumes very little home electricity, and is compatible with all washing machine models. The CleanStart® detergentless laundry system utilizes the same technology that RainSoft has developed for Hilton, Marriott, and other commercial clients for their high-volume laundry operations. 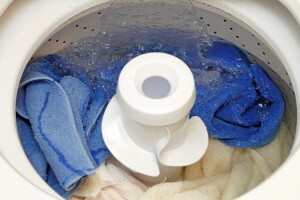 What other benefits are associated with using the CleanStart® detergentless laundry system? One very important one is that it is an environmentally friendly alternative to conventional laundry cleaning products, many of which contain chemicals that are effective at cleaning clothes but harmful to the environment. Also, by not having to wash clothes in warm or hot water, you will lower your family’s energy consumption and, in turn, shrink the size of your carbon footprint. A second notable benefit of using the CleanStart® detergentless laundry system is that it produces laundered clothing that’s gentler on infants and others with sensitive skin. With harsh cleaning products totally taken out of the equation, your family will have longer-lasting clothing that doesn’t cause any skin irritation. RainSoft’s CleanStart® is an eco-friendly laundry solution that’s designed to help you save money and provide your family with the cleanest and most comfortable laundry possible. It is backed by a Limited Lifetime Warranty and was developed by one of the biggest names in the residential water treatment industry. Please contact RainSoft today if you would like to learn more about the CleanStart® detergentless laundry system, which is fully compatible with top loading washing machines, front loading washing machines, and high efficiency (HE) washers.